Plato (428/427 BC Ð 348/347 BC), whose original name was Aristocles, was an ancient Greek philosopher, the second of the great trio of ancient Greeks, succeeding Socrates and preceding AristotleÐ who between them laid the philosophical foundations of Western culture. Plato was also a mathematician, writer of philosophical dialogues, and founder of the Academy in Athens, the first institution of higher learning in the western world. Plato is widely believed to have been a student of Socrates and to have been deeply influenced by his teacher's unjust death. Plato's brilliance as a writer and thinker can be witnessed by reading his Socratic dialogues. Some of the dialogues, letters, and other works that are ascribed to him are considered spurious. Plato is thought to have lectured at the Academy, although the pedagogical function of his dialogues, if any, is not known with certainty. They have historically been used to teach philosophy, logic, rhetoric, mathematics, and other subjects about which he wrote. Plato influenced the work of Aristotle, Neoplatonism, Cicero, Plutarch, Stoicism, Anselm, Descartes, Hobbes, Leibniz, Mill, Schopenhauer, Nietzsche, Heidegger, Arendt, Gadamer and countless other western philosophers and theologians. Plato's influences were Socrates, Homer, Hesiod, Aristophanes, Aesop, Protagoras, Parmenides, Pythagoras, Heraclitus and Orphism. Plato was born to an aristocratic family in Athens. His father, Ariston, was believed to have descended from the early kings of Athens. Perictione, his mother, was distantly related to the 6th-century B.C. lawmaker Solon. When Plato was a child, his father died, and his mother married Pyrilampes, who was an associate of the statesman Pericles. Plato's original name was Aristocles, but in his school days he received the nickname Platon (meaning "broad" ) because of his broad shoulders. It was mostly in Pyrilampes' house that Plato was brought up. Aristotle writes that when Plato was a young man he studied under Cratylus who was a student of Heracleitus, famed for his cosmology which is based on fire being the basic material of the universe. 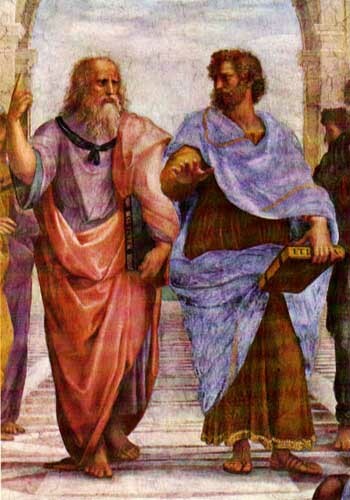 It almost certain that Plato became friends with Socrates when he was young, for Plato's mother's brother Charmides was a close friend of Socrates. The Peloponnesian War was fought between Athens and Sparta between 431 BC and 404 BC. Plato was in military service from 409 BC to 404 BC but at this time he wanted a political career rather than a military one. At the end of the war he joined the oligarchy of the Thirty Tyrants in Athens set up in 404 BC, one of whose leaders being his mother's brother Charmides, but their violent acts meant that Plato quickly left. In 403 BC there was a restoration of democracy at Athens and Plato had great hopes that he would be able to enter politics again. However, the excesses of Athenian political life seem to have persuaded him to give up political ambitions. In particular, the execution of Socrates in 399 BC had a profound effect on him and he decided that he would have nothing further to do with politics in Athens. Plato left Athens after Socrates had been executed and traveled in Egypt, Sicily and Italy. In Egypt he learned of a water clock and later introduced it into Greece. In Italy he learned of the work of Pythagoras and came to appreciate the value of mathematics. He studied with the disciples of Pythagoras. On his return to Athens Plato founded, in about 387 BC, on land which had belonged to Academos, a school of learning which being situated in the grove of Academos was called the Academy. On his journeys he decided to devote the rest of his life to philosophy. In 389 B.C. he founded a school in Athens. Because it was on the grounds that had once belonged to a legendary Greek called A cademus, it came to be called the Academy, and this term has been d for schools ever since. The institution often described as the first European university. The Academy provided a comprehensive curriculum, including such subjects as astronomy, biology, mathematics, political theory, and philosophy. The main purpose of the Academy was to cultivate thought to lead to a restoration of decent government in the cities of Greece. Like Socrates, Plato was chiefly interested in moral philosophy and despised natural philosophy (that is, science) as an inferior and unworthy sort of knowledge. To Plato, knowledge had no practical use, it existed for the abstract good of the soul. At the heart of Plato's philosophy is his theory of Forms, or Ideas. Ultimately, his view of knowledge, his ethical theory, his psychology, his concept of the state, and his perspective on art must be understood in terms of this theory. Socrates says in the Republic that people who take the sun-lit world of the senses to be good and real are living pitifully in a den of evil and ignorance. Socrates admits that few climb out of the den, or cave of ignorance, and those who do not only have a terrible struggle to attain the heights, but when they go back down for a visit or to help other people up, they find themselves objects of scorn and ridicule. The allegory of the cave (often said by scholars to represent Plato's own epistemology and metaphysics) is intimately connected to his political ideology (often said to also be Plato's own), that only people who have climbed out of the cave and cast their eyes on a vision of goodness are fit to rule. Socrates claims that the enlightened men of society must be forced from their divine contemplations and compelled to run the city according to their lofty insights. Thus is born the idea of the "philosopher-king", the wise person who accepts the power thrust upon him by the people who are wise enough to choose a good master. This is the main thesis of Socrates in the Republic, that the most wisdom the masses can muster is the wise choice of a ruler. Labelled Plato's "metaphysics" because Aristotle's musings about divine reality came after ("meta") his lecture notes on his treatise on nature ("physics"), Socrates division of reality into the warring and irreconciliable domains of the material and the spiritual has been of incalculable influence in the history of Western philosophy and religion. Plato's theory of Forms and his theory of knowledge are so interrelated that they must be discussed together. Influenced by Socrates, Plato was convinced that knowledge is attainable. He was also convinced of two essential characteristics of knowledge. First, knowledge must be certain and infallible. Second, knowledge must have as its object that which is genuinely real as contrasted with that which is an appearance only. Because that which is fully real must, for Plato, be fixed, permanent, and unchanging, he identified the real with the ideal realm of being as opposed to the physical world of becoming. One consequence of this view was Plato's rejection of empiricism, the claim that knowledge is derived from sense experience. He thought that propositions derived from sense experience have, at most, a degree of probability. They are not certain. Furthermore, the objects of sense experience are changeable phenomena of the physical world. Hence, objects of sense experience are not proper objects of knowledge. Plato's own theory of knowledge is found in the Republic, particularly in his discussion of the image of the divided line and the myth of the cave. In the former, Plato distinguishes between two levels of awareness: opinion and knowledge. Claims or assertions about the physical or visible world, including both commonsense observations and the propositions of science, are opinions only. Some of these opinions are well founded; some are not; but none of them counts as genuine knowledge. The higher level of awareness is knowledge, because there reason, rather than sense experience, is involved. Reason, properly used, results in intellectual insights that are certain, and the objects of these rational insights are the abiding universals, the eternal Forms or substances that constitute the real world. The myth of the cave describes individuals chained deep within the recesses of a cave. Bound so that vision is restricted, they cannot see one another. The only thing visible is the wall of the cave upon which appear shadows cast by models or statues of animals and objects that are passed before a brightly burning fire. Breaking free, one of the individuals escapes from the cave into the light of day. With the aid of the sun, that person sees for the first time the real world and returns to the cave with the message that the only things they have seen heretofore are shadows and appearances and that the real world awaits them if they are willing to struggle free of their bonds. The shadowy environment of the cave symbolizes for Plato the physical world of appearances. Escape into the sun-filled setting outside the cave symbolizes the transition to the real world, the world of full and perfect being, the world of Forms, which is the proper object of knowledge. What people have actually seen are drawn figures that are more or less close approximations of the ideal circle. In fact, when mathematicians define a circle, the points referred to are not spatial points at all; they are logical points. They do not occupy space. Nevertheless, although the Form of a circle has never been seen-indeed, could never be seen-mathematicians and others do in fact know what a circle is. That they can define a circle is evidence that they know what it is. For Plato, therefore, the Form "circularity" exists, but not in the physical world of space and time. It exists as a changeless object in the world of Forms or Ideas, which can be known only by reason. Forms have greater reality than objects in the physical world both because of their perfection and stability and because they are models, resemblance to which gives ordinary physical objects whatever reality they have. Circularity, squareness, and triangularity are excellent examples, then, of what Plato meant by Forms. An object existing in the physical world may be called a circle or a square or a triangle only to the extent that it resembles - "participates in" is Plato's phrase - the Form "circularity" or "squareness" or "triangularity." Plato extended his theory beyond the realm of mathematics. Indeed, he was most interested in its application in the field of social ethics. The theory was his way of explaining how the same universal term can refer to so many particular things or events. The word justice, for example, can be applied to hundreds of particular acts because these acts have something in common, namely, their resemblance to, or participation in, the Form "justice." An individual is human to the extent that he or she resembles or participates in the Form "humanness." If "humanness" is defined in terms of being a rational animal, then an individual is human to the extent that he or she is rational. A particular act is courageous or cowardly to the extent that it participates in its Form. An object is beautiful to the extent that it participates in the Idea, or Form, of beauty. Everything in the world of space and time is what it is by virtue of its resemblance to, or participation in, its universal Form. The ability to define the universal term is evidence that one has grasped the Form to which that universal refers. Plato conceived the Forms as arranged hierarchically; the supreme Form is the Form of the Good, which, like the sun in the myth of the cave, illuminates all the other Ideas. There is a sense in which the Form of the Good represents Plato's movement in the direction of an ultimate principle of explanation. The Good is perfect and desired by all who know it. In the Philebus he wonders, Is it pleasure or knowledge? He shows that pleasure cannot be the Good; pleasures are often accompanied by false opinions, and great pleasures and pains occur in bad states of body or soul. Knowledge is not perfect either, because some arts are more exact than others. The Good can be neither knowledge nor pleasure alone, but a mixture of the best parts of both, which include the sciences and those pleasures that are pure and necessary. The best parts of this mixture are beauty, symmetry, and truth, which are all closer to knowledge than pleasure. He finally gives the order of value as measure, beauty, mind, science, and pure pleasure. Plato had an essentially antagonistic view of art and the artist, although he approved of certain religious and moralistic kinds of art. His approach is related to his theory of Forms. A beautiful flower, for example, is a copy or imitation of the universal Forms "flowerness" and "beauty." The physical flower is one step removed from reality, that is, the Forms. A picture of the flower is, therefore, two steps removed from reality. This also meant that the artist is two steps removed from knowledge, and, indeed, Plato's frequent criticism of the artists is that they lack genuine knowledge of what they are doing. Artistic creation, Plato observed, seems to be rooted in a kind of inspired madness. Plato's influence throughout the history of philosophy has been monumental. When he died, Speusippus became head of the Academy. The school continued in existence until AD 529, when it was closed by the Byzantine emperor Justinian I, who objected to its pagan teachings. Plato's impact on Jewish thought is apparent in the work of the 1st-century Alexandrian philosopher Philo Judaeus. Neoplatonism, founded by the 3rd-century philosopher important later development of Platonism. The theologians Clement of Alexandria, Origen, and St. Augustine were early Christian exponents of a Platonic perspective. Platonic ideas have had a crucial role in the development of Christian theology and also in medieval Islamic thought. The theory of Forms may best be understood in terms of mathematical entities. A circle, for instance, is defined as a plane figure composed of a series of points, all of which are equidistant from a given point. No one has ever actually seen such a figure, however. What people have actually seen are drawn figures that are more or less close approximations of the ideal circle. In fact, when mathematicians define a circle, the points referred to are not spatial points at all; they are logical points. They do not occupy space. Nevertheless, although the Form of a circle has never been seen-indeed, could never be seen-mathematicians and others do in fact know what a circle is. That they can define a circle is evidence that they know what it is. For Plato, therefore, the Form "circularity" exists, but not in the physical world of space and time. It exists as a changeless object in the world of Forms or Ideas, which can be known only by reason. Forms have greater reality than objects in the physical world both because of their perfection and stability and because they are models, resemblance to which gives ordinary physical objects whatever reality they have. Circularity, squareness, and triangularity are excellent examples, then, of what Plato meant by Forms. An object existing in the physical world may be called a circle or a square or a triangle only to the extent that it resembles ("participates in" is Plato's phrase) the Form "circularity" or "squareness" or "triangularity." Plato extended his theory beyond the realm of mathematics. Indeed, he was most interested in its application in the field of social ethics. The theory was his way of explaining how the same universal term can refer to so many particular things or events. The word justice, for example, can be applied to hundreds of particular acts because these acts have something in common, namely, their resemblance to, or participation in, the Form "justice." An individual is human to the extent that he or she resembles or participates in the Form "humanness." If "humanness" is defined in terms of being a rational animal, then an individual is human to the extent that he or she is rational. A particular act is courageous or cowardly to the extent that it participates in its Form. An object is beautiful to the extent that it participates in the Idea, or Form, of beauty. Everything in the world of space and time is what it is by virtue of its resemblance to, or participation in, its universal Form. The ability to define the universal term is evidence that one has grasped the Form to which that universal refers. Plato was fond of mathematics because of its idealized abstractions and its separation from the merely material. Nowadays, the purest mathematics manages to be applied, sooner or later, to practical matters of science. In Plato's day this was not so, and the mathematician could well consider himself as dealing only with the loftiest form of pure thought and as having nothing to do with the gross and imperfect everyday world. And so above the doorway to the Academy was written, "Let no one ignorant of mathematics enter here." Plato did, however, believe that mathematics in its ideal form could still be applied to the heavens. The heavenly bodies, he believed, exhibited perfect geometric form. This he expresses most clearly in a dialogue called Timaeus in which he presents his scheme of the universe. He describes the five (and only five) possible regular solids -- that is, those with equivalent faces and with all lines and angles, formed by those faces, equal. These are the four-sided tetrahedron, the six-sided hexahed ron (or cube), the eight-sided octahedron, the twelve-sided dodecahedron, and the twenty-sided icosahedron. Four of the five regular solids, according to Plato, represented the four elements, while the dodecahedron represented the universe as a whole. These solids were first discovered by the Pythagoreans, but the fame of this dialogue has led to their being called the Platonic solids ever since. Plato decided also that since the heavens were perfect, the various heavenly bodies would have to move in exact circles (the perfect curve) along with the crystalline spheres (the perfect solid) that held them in place. The spheres were another Pythagorean notion, and the Pythagorean preoccupation with sound also shows itself in Philolaus belief that the spheres of the various planets made celestial music as they turned -- a belief that persisted even in the time of Kepler two thou sand years later. We still use the phrase "the music of the spheres" to epitomize heavenly sounds or the stark beauty of outer space. Plato's principal work touching on scientific questions, the Timaeus, bluntly states that this world "in very truth [is] a living creature with soul and reason." To this viewpoint Plato accords an unconditional primacy even in matters of detail. Thus when he discusses the working of the human eye, he deplores the fact that "the great mass of mankind regard [the geometrical and mechanical aspects of the question] as the sole causes of all things." Against this he opposes the classification of causes into two groups: the accessory or mechanical causes that are "incapable of any plan or intelligence for any purpose," and those that "work with intelligence to produce what is good and desirable." The reaffirmation of the Socratic or organismic approach in science could hardly be more unequivocal. Such an emphasis on the concept of organism as the basic framework in which the cosmos is to be explained derived only in part from factors like the emergence in the fifth century of the Hippocratic medical theory and practice. The principal factor was a deeper and more universal one. It was rooted in the Greek nature as such and was given unchallenged prominence when cultural developments forced the Greek mind to reflect on the consequences of a mechanistic explanation of the inanimate and animate world including man both as an individual and as a member of society. The "Greekness" of the organismic approach can be seen in the fact that they first applied the term cosmos to a patently living thing - a well-ordered society - and only afterward to the orderliness of the physical world. Rooted deeply in their personal, cultural inclinations, this organismic approach to reality, once it became the conscious possession of the Greeks, had never been seriously questioned or abandoned by them. Single views of the Ionians and atomists continued, of course, to play seminal roles in Greek science. What is more, once the cultural crisis evidenced by the activity of the Sophists was over, even the poets began to take more kindly to the physikoi, who for a while were the principal targets of plays concerned with the source of various cultural evils. At any rate, the Ionians ceased to be called in literary circles, as Plato remarks, "she dogs uttering vain howlings and talking other nonsense of the same sort." This was, however, merely a concession that could easily be meted out by those who won the cultural battle. For as Plato could confidently state in the same context, the authority of the mechanical views had been checked, or to paraphrase his words, the case was reversed in favor of the organismic viewpoint. The Republic, Plato's major political work, is concerned with the question of justice and therefore with the questions "what is a just state" and "who is a just individual?" Plato associates the traditional Greek virtues with the class structure of the ideal state. Temperance is the unique virtue of the artisan class; courage is the virtue peculiar to the military class; and wisdom characterizes the rulers. Justice, the fourth virtue, characterizes society as a whole. The just state is one in which each class performs its own function well without infringing on the activities of the other classes. Plato divides the human soul into three parts: the rational part, the will, and the appetites. The just person is the one in whom the rational element, supported by the will, controls the appetites. An obvious analogy exists here with the threefold class structure of the state, in which the enlightened philosopher-kings, supported by the soldiers, govern the rest of society. Plato had an essentially antagonistic view of art and the artist, although he approved of certain religious and moralistic kinds of art. Again, his approach is related to his theory of Forms. A beautiful flower, for example, is a copy or imitation of the universal Forms "flowerness" and "beauty." The physical flower is one step removed from reality, that is, the Forms. A picture of the flower is, therefore, two steps removed from reality. This also meant that the artist is two steps removed from knowledge, and, indeed, Plato's frequent criticism of the artists is that they lack genuine knowledge of what they are doing. Artistic creation, Plato observed, seems to be rooted in a kind of inspired madness. The concluding years of Plato's life were spent lecturing at the Academy and writing. At age 60 - the arrival of Aristotle - age 18 - as a student at Plato's Academy, where he will stay until Plato's death in 347. Plato's influence throughout the history of philosophy has been monumental. When he died, Speusippus became head of the Academy. Aristotle is by now about 38 and leaves the Academy perhaps because he was not chosen - or perhaps he had another destiny. The school continued in existence until AD529, when it was closed by the Byzantine emperor Justinian I, who objected to its pagan teachings. Plato's impact on Jewish thought is apparent in the work of the 1st-century Alexandrian philosopher Philo Judaeus. Neoplatonism, founded by the 3rd-century philosopher Plotinus, was an important later development of Platonism. The theologians Clement of Alexandria, Origen, and St. Augustine were early Christian exponents of a Platonic perspective. Platonic ideas have had a crucial role in the development of Christian theology and also in medieval Islamic thought (see Islam). During the Renaissance, the primary focus of Platonic influence was the Florentine Academy, founded in the 15th century near Florence. Under the leadership of Marsilio Ficino, members of the Academy studied Plato in the original Greek. In England, Platonism was revived in the 17th century by Ralph Cudworth and others who became known as the Cambridge Platonists. Plato's influence has been extended into the 20th century by such thinkers as Alfred North Whitehead, who once paid him tribute by describing the history of philosophy as simply "a series of footnotes to Plato." Plato died at about the age of 80 in Athens in 347 BC. Plato's works, perhaps the most consistently popular and influential philosophic writings ever published, consist of a series of dialogues in which the discussions between Socrates and others are presented with infinite charm. Most of our knowledge of Socrates is from these dialogues, and which views are Socrates' and which are Plato's is anybody's guess. Plato cautiously never introduced himself into any of the dialogues. The works that have been transmitted to us through the middle ages under the name of Plato consist in a set of 41 so-called "dialogues" plus a collection of 13 letters and a book of Definitions. But it was already obvious in antiquity that not all of these were from Plato's own hand. The exact ordering of the dialogues is not known, but they can be roughly assigned to three periods, the early, middle, and late. The early dialogues, began after 399 B.C., are seen by many as memorials to the life and teaching of Socrates. The tetralogies of Greek theater were made up of one comedy and a trilogy of tragedies. If there is anything in the idea that Plato grouped his dialogues according to such an arrangement, it might explain why we sometimes hear of tetralogies, sometimes of trilogies. Plato, The Collected Dialogues including the Letters, edited by Edith Hamilton and Huntington Cairns, with Introduction and Prefatory Notes, Bollingen Series LXXI, Princeton University Press, 1961. Plato, Complete Works, Edited, with Introduction and Notes, by John M. Cooper, Hackett Publishing Company, Indianapolis/Cambridge, 1997. Epinomis, translated by Richard D. McKirahan, Jr.